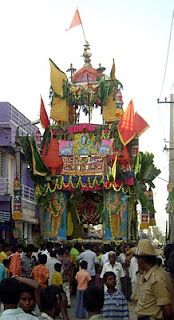 Ramanagaram on 30th January 2010 witnessed the spectacular chariot festival. The diety Sri Arkeshwara Swamy temple on the banks of river Arkavathy has its place in the history of Ramanagaram. Every year the chariot festival is conducted with much devotion and fervour. This year too the chariot festival was more successful than yesteryears. People from all walks of life and from surrounding taluks participated in the festival and offered their prayers to Lord Arkeshwara. Many organisations had putup make shift stalls and offered neerumajjige (buttermilk), panaka(musk melon/lemon juice sweetned with jaggery) that quenched the thirst of hundreds of devotees. Lord Arkeshwara Swamy idol mounted on 30 feet tall (approx) chariot pulled by the devotees from the temple premises on Choultry Street made its journey thru Agrahara, M.G.Road, Main Road and again thru Choultry Street to reach the temple finally.